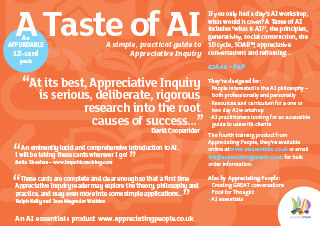 We currently offer two training events: A taste of AI (below) and Developing your AI practice. These events are currently organised by partner churches according to their needs, and their practice is to open these to participants from other organisations. Dates will be advertised here and on Facebook and Twitter as soon as they become known. If you would like to register your interest to take part in the next training event please contact us..
A 24-hour residential course introducing Appreciative Inquiry as a way of working in churches exploring development and change. Those attending will be introduced to the underlying theory, as well as examples of good practice, with a view to using appreciative techniques in their own work, and in the life of their churches. Fee: To be announced (inc. resources and full board accommodation). Booking: To register your interest for a future course, please contact us. This course is part of Appreciating Church, an ecumenical partnership between the United Reformed Church, Methodist Church, Quakers, Congregational Federation and parts of the Church of England, to create a self-sustaining community of AI practice in association with Appreciating People. Participation in this course is the first step to meet the necessary requirements for joining the advanced Developing Your Appreciative Inquiry Practice course.